We all know the universe is large, very large, but is it possible to really comprehend just how large it really is? Sit down, take a deep breath, and we can give it a go. In my previous scale article, we considered the sizes of stars, and finished by imagining the sun being the size of an orange. On this scale, the nearest star to the sun, also the size of an orange, would be 2,300 kilometres away. Even through stars can be immense on human scales, they are dwarfed by the distances between them. Let’s continue our journey outwards and consider larger distances in the universe. The first stop is our cosmic home, the Milky Way galaxy. From our vantage point, buried deep within, the Milky Way appears as a broad band of stars encircling the sky. On a clear night, away from the lights of civilisation, we may be able to pick out a few thousand individual stars as mere points of light. The smooth swathe of light that accompanies them, however, is the combined light of many more distant stars. How many? It turns out the Milky Way is home to more than 200 billion stars, lots of stars like the sun, a few spectacular giants, and many, many faint dwarfs. To get a handle on the size of the Milky Way, let’s pretend the distance across it is 3,000km, roughly the distance between Sydney and Perth. On this scale, the separation between the sun and its nearest neighbour would be about 100 metres, whereas the diameter of the sun itself would be about a tenth the thickness of a human hair. Other than a bit of tenuous gas, there’s a lot of empty space in the Milky Way. For much of human history, we have prided ourselves on being at the centre of the universe, but as Douglas Adams pointed out, we live in the “unfashionable end of the Western Spiral arm of the Galaxy”. So the Milky Way is huge, and light, traveling at 300,000 kilometres a second, takes 100,000 years to cross from side to side. But we know that we share the universe with many other galaxies, one of the nearest being a sister galaxy to our own, the large spiral galaxy in Andromeda. 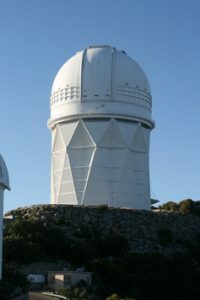 I am writing this in the dome of the 4-metre Mayall Telescope at Kitt Peak in Arizona, during a night where we are observing the Andromeda galaxy. As the light falls on our electronic detectors, it’s always startling to think it has taken more than two million years to travel from there to here, and we are seeing Andromeda as it was before our ancestors, homo ergaster, walked Earth. Andromeda and the Milky Way inhabit a small patch of the universe known as the Local Group. While these two galaxies are by far the largest members, there are another 70 galaxies that are considerably smaller. To think about the scale of the Local Group, imagine that the Milky Way is a large dinner plate, with a diameter of roughly 25cm. 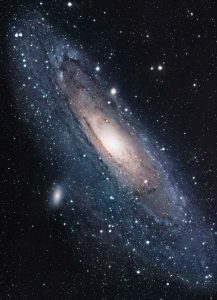 With this, the Local Group would occupy the volume of a five storey building, one that is as wide and deep as it is tall, and if the Milky Way sits on a table on the second floor, Andromeda would be a plate on a table on the fourth floor. Spread throughout the rest of the building would be the 70 other Local Group galaxies. While some will be scattered almost randomly, many will be closer to the larger galaxies, but as dwarfs, most would be only a centimetre or less in size. While dwarfs represent the smallest of galaxies, we know we share the universe with some absolute galactic monsters. The largest yet discovered goes by the unassuming name of IC 1101, located a billion light years away (a single light year being equivalent to slightly less than 10 trillion kilometres) from the Milky Way. It truly dwarfs the Milky Way, containing more than a trillion stars, and would easily fill our five storey building. So, we approach the ultimate distance scale for astronomers, the size of observable universe. year history since the Big Bang. Due to the expansion of the universe, the most distant objects are a mind-boggling 46 billion light years away from us. 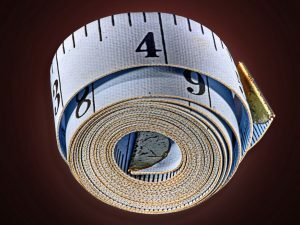 Can we hope to put this on some sort of understandable scale? The answer is yes! 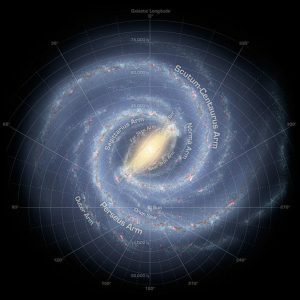 Let’s think of the entire Milky Way as a 10c coin, roughly one centimetre across. Andromeda would be another 10c coin just quarter of a metre away, and the Local Group could easily be held in your arms. The edge of the Observable Universe would be 5km away, and the universe would be awash with 300 billion large galaxies, such as our own Milky Way, living in groups and clusters, accompanied by an estimated ten trillion dwarf galaxies. This is a total of 30 billion trillion individual stars. And yet most of the universe is almost completely empty. At the edge of the Observable Universe, we have almost reached the end of our journey. We are left with the question of what is beyond the Observable Universe? Just how much more is out there? If we combine all of our observations of the universe, with our theoretical understanding of just how it works, we are left with a somewhat uncomfortable fact. The universe appears to be infinite in all directions, containing a infinite number of galaxies and stars. And that really is a lot to think about.